Published January 1, 2014 By Anna T. This post may contain affiliate links. Regardless, I only recommend sites I've researched and/or used and trust. The first day of the new year is the perfect time to share reminders of all the popular seasonal work from home positions that are upcoming so you'll know when to start checking for openings. Many of these are worth getting in with if you can. I try to alert you all via social media and this blog so you'll know when it's time to start applying for seasonal jobs, but I know a list would be helpful (for both you and also me so I can refer back and not forget to post reminders!). I know not everyone wants to do seasonal work, but these positions can get you through for a period of time until you can find something else. This is phone work where background noise doesn't matter. Read full Yardi-Matrix review here. They hire three times a year for the work, which last six weeks each season. You can put your resume in during the months of December, April, and August for the winter, spring, and fall rent surveys. The application information is always posted here. You can do seasonal phone work from home for several major flower companies, including 1-800-Flowers, Teleflora, and Blooms Today. These companies start hiring seasonal workers in preparation for major holidays where flowers are often sent — Valentine's Day, Mother's Day, Christmas, and so forth, so it's a good idea to start checking for openings with these companies about a month prior to those holidays. This company hires seasonal workers nationwide to take sports – camping reservation requests over the phone. It's easy work, but pay is low at around $8.25 an hour. Their season runs from May through September. You can view their job openings here or read my full review of Aspira (formerly Active Network) work at home jobs here. Write Score hires a large number of work from home essay scorers each year. The work starts in August and runs through May. You need at least a two-year degree to be considered for the work. Hiring usually starts at the beginning of July every year. Read my full review of scoring jobs at Write Score here, or go ahead and check for openings here. This is another company with regular openings for remote test scorers (also known as reader/evaluators). They have a need for scorers from September to June each year, with the need being the most extreme during January to June. You will qualify for the work as long as you're eligible to work in the US and you have a four-year bachelor's degree. You can go here to read my review of Measurement, Inc. and here to see their openings. Amazon always hires a bunch of extra work from home customer service reps in preparation for the busy Christmas season. They hire in various states nationwide. The states I most often see work from home openings in are Arizona, Washington, Oregon, Texas, Kentucky, and West Virginia. You'll usually start seeing these openings listed around October every year. You can go here to see the information on these positions, and you can read my full review of Amazon work at home jobs here. Williams-Sonoma usually starts hiring work at home customer service agents for the busy holiday season beginning around September or October of each year. Unfortunately, these positions are only open to people located in or near The Colony, TX at this time. The job pays $11 an hour, and many benefits are provided. You can go here to check for the position, or read our review of Williams-Sonoma work from home jobs here. 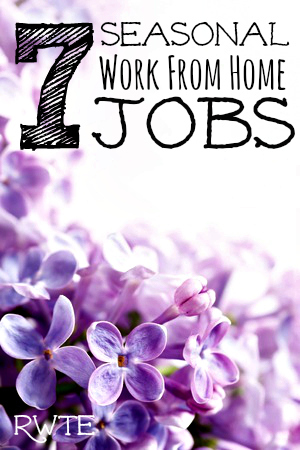 I've used FlexJobs in the past for searching up new work at home jobs and highly recommend it. There is a small monthly fee ($14.95) to access their listings, but there are no ads or scams on their site, plus hundreds of leads get added every week. You can get up to 30 percent off your payment with promo code AFFILPROMO. If you're not satisfied with the quality of the leads, they'll give you your money back, and you can of course cancel any time you want. I've had my membership for over a year and I love it! You can go here for a preview of some seasonal work that is open now.